A Japan Coast Guard's patrol boat, left bottom, discharges water against Taiwanese fishing boats near disputed islands called Senkaku in Japan and Diaoyu in China, in the East China Sea, Tuesday, Sept. 25, 2012. About 40 Taiwan fishing boats and eight Taiwan Coast Guard vessels entered waters that Japan considers its territory on Tuesday, the Japanese Coast Guard said, adding an unpredictable twist to a bitter row between Tokyo and Beijing. China's Ministry of Agriculture for its part said close to 200 Chinese boats have been fishing in seas around a group of rocky islands disputed with Japan. The brief Chinese statement did not specify whether the boats were all there at one time, nor did it say how close they were to the islands. 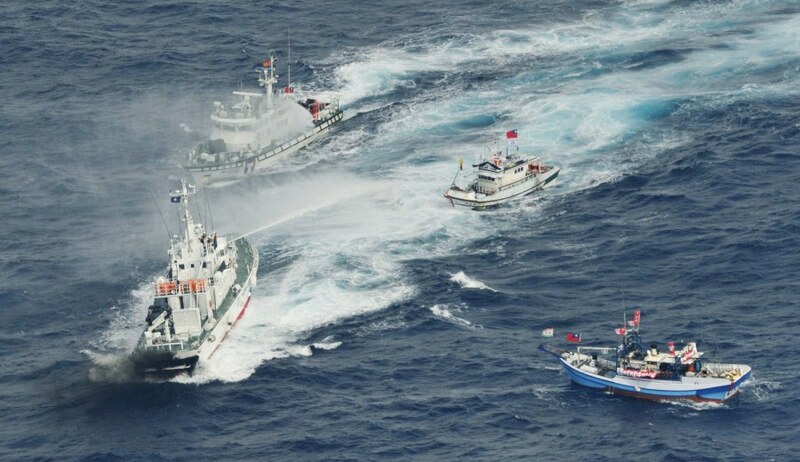 Beijing, which regards self-ruled Taiwan as a renegade province, may have included Taiwan fishing vessels in its estimate. Read the full story.